As a wedding celebrates the love of the couple, design a romantic wedding centerpiece that showcases your feelings. You can pick the traditional colors of romance for your flowers and select items that symbolize romance for your containers as you create the table arrangements. Another option is to follow the messages given to flowers as you design the centerpiece, such as a red flower signifies passionate love while a white one means innocence. Use a red rose to symbolizes love in your wedding centerpiece..
Pegged votive containers sit above three tall column vases. The columns contain opalescent cut glass, while the votives hold pink glass and a crystal light to cast a soft glow on the table. Situated between the vases is a low-lying vase hidden by a collection of ferns, eucalyptus leaves and other greenery darting around the columns. The center of the greenery holds five pale pink roses. This romantic pink and white display is placed inside a round mirror on the center of the table. 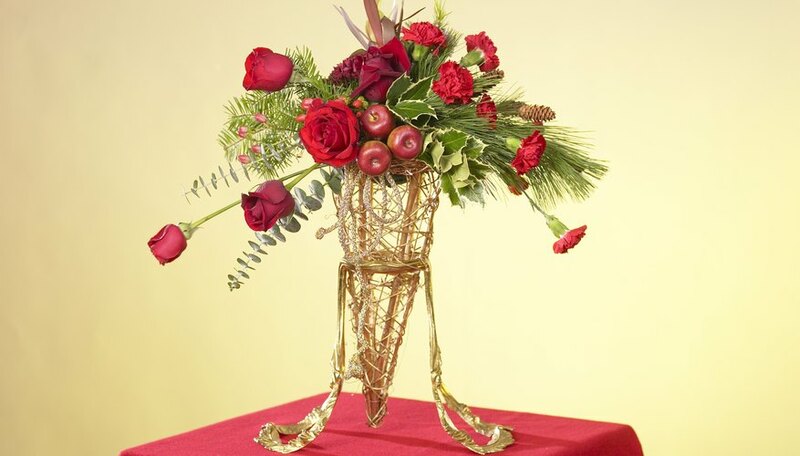 Design a romantic centerpiece with around red and cream. A wide, creamy white table runner lines the center of the table. Tiny, red, heart- shaped ceramic containers alternate with cream fan-shaped vases on the runner. (Position the vases to fall in between the chairs to allow conversation.) Cream tea lights, inside the hearts, illuminate the table with a romantic glow, while vivid red roses in the vase permeate the air with their perfumed smell. Other red flowers to consider include the tulip, celosia, scorpion orchid or the Peruvian lily. Soft flickering light bounces shadows on the face of the guests from the center of the table. Layered inside a larger bowl, a small white pillar candle nestles inside a smaller bowl of sand. Dendrobium orchids peek out of the larger bowl and flows over the sides, while pressing their blossoms along the sides of the bowl. The lit candle backlights the petals of the flowers highlighting the deep vivid colors within. Other purple flowers to consider include cattleya orchid, cirsium, fritillaria or iris. Let your heart be your guide as you design a heart-themed centerpiece. A small, heart- shaped vase holds a small dome shaped flower arrangement with several stalks of bright pink and vivid red flowers. Flower includes anthurium, alstroemeria, amaryllis, celosia, calla lily or orchids. The flowers fill the center space left by a heart-shaped topiary of pink and red roses behind the vase. Heart picture frames hold photographs of the couple as rose petals are strewn down the center of the table. Forever Wed: Reative Reception Decoration Ideas! de, Angelique. "Romantic Wedding Centerpiece Ideas." Dating Tips - Match.com, https://datingtips.match.com/romantic-wedding-centerpiece-ideas-7930140.html. Accessed 24 April 2019.